The Sultanate of Sulu (Philippines) existed from 1789 to 1940. Based on photos on Royal Panji - Flags and Symbols of the Royal Sultanates of Sulu - Ranao Area and Maguindanao, I've used the images to create some better proper images for them. I found a description of an old Sulu flag. The flag was white with the black sultan's arms (the Mecca doors) in the center. The flag was dated around 1863 and is supposed to have been adopted under the influence of Prussia. Now I have more information about the flag. Herve Calvarin, in the last issue of Franciae Vexilla, quoted a similar flag (dated c.1780) as white with narrow black border and the arms in it. The white is attributed to the Bourbons. After reading the article, I believe now that the white and black were probably the Sultan's colors (like other sultans in the area) without reference to France or Prussia. The current seal has two Spanish fortresses (according to Flag Bulletin) but Calvarin thought that the fortress is in fact the Mecca doors. With the death of the last Sultan of Sulu the Philippine government has refused to recognize an heir to the sultanate ever since. The Sulu Sultanate existed before 1798; in 1675 there was a Sulu Islamic Empire formed by five territories : Kalimantan, Sabah, Palawan, Basilan and Sulu. The symbols on the flag of Sulu represent the two towers at the entrance to the city of Jolo not the Mecca doors nor the symbols of the Sultan, so this representation is not correct. The "door" on the symbol of the province of Sulu is not the Mecca door, it is one of the entrance of Jolo that was, under the Spanish a wallet city. The only meaning on the representation of the door , with the two towers is to show one of the most characteristic symbol of the City. The Muslim population of the southern Philippines, in the vast mosaic of peoples of the Far East, is certainly not an exception when it comes to making flags of various types and standards. From Sulu to Palawan and Mindanao (where the Maranao utilization of flags, standards, and vexilloids is regulated by traditional codes that describes forms, colors, ways and times for the use of flags) flags have always played an important role; especially in the Sulu archipelago that was the center of a sultanate, the "Islamic Empire of Sulu", which rose in 1401 and achieved its highest glory towards 1675 and survived until 1919. The first known flag of Sulu is that one described by some travelers like the French naturalist, Sonnerat, who reported of his travel to Sulu between 1774 and 1781 spoke about a flag with "...white broadside of black and within the center is the coat of arms of the Sultan that is Mecca's door..."
There are two hypotheses to the origins of the white and black colors of the Sulu Sultanate's flag. One believes that the white field represents the colors of the Bourbons of France, a country with which the Sultan of Sulu established privileged relationships and started negotiations in order to make to the Sultanate a French protectorate and to counter the Spanish hegemony in the area at the time. The other is that the white and the black colors of the Sulu Sultan's flag was a copy of a Prussian flag the Sultan may have seen on a Prussian ship traveling the Orient in 1763 and which may have touched the coasts of Sulu. However, neither of these hypotheses is supported by existing facts. The resemblance of the Sultanate's flag to both the Prussian and Bourbon (French and Spanish) flags are accidental. The black frame and the Sultanate's own symbols do not have any comparison with any European flags. But the Sultan's coat of arms that Sonnerat identifies as Mecca's door is actually the stylized grave markers of funeral monuments relating to two fundamental personages in the history of the sultanate of Sulu: Sultan Shariful Hashim, the first Sultan of Sulu who died in 1431 and Sharif Ali, known as Sultan Berkat of Brunei, who introduced the Islamic religion in Sulu and who died in 1432. 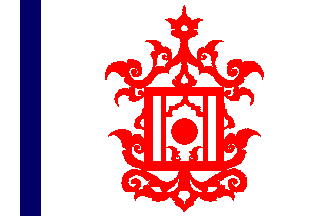 According to some scholars the coat of arms of the Sultan could not represent Mecca's door because until 1882 no Sultan of Sulu had any idea what the door looked like as it was only in that year that Sultan Badaruddin II went on a pilgrimage to the Holy City of Islam and was the first reigning of Sulu to complete this action. But this hypothesis is a little risky because the presence of missionaries from the Arabic Peninsula and the exchanges and trades between Sulu and the other countries carried in the archipelago news and information on the cradle of Islam and its most important temple and fantastic descriptions that rendered its glory. Surprisingly, there are two other symbols that are similar but not identical to that found in the white flag with the black broadside. One is on the flag called "Moro Battle Flag " which dates back to the period of Sultan Sharafuddin (1791-1808). Other scholars believe they are as recent as 1899 to 1919. There are two considerations for these divergent dates. Between 1791 and 1808 the Sultanate was at its maximum splendor and extended its reign to five territories: Kalimantan, Sabah, Palawan, Basilan and Sulu. As many stars were put on the war flag. In homage to the traditions of the State, the coat of arms of the monarch was maintained which was inherited from the black and white flag used since 1433. This hypothesis leave on the field various doubts on the fact that the present symbols on the "Moro Battle Flag" are the same of that one cited by Sonnerat. The two stylized grave markers appear to be two typical shields of the Sulu area. Moreover, also admitting that they are two grave markers they appear deprived of the pyramidal or triangular at the top and the reason is not understood. We can say that observing other Moro battle flags of the same age, the symbols with the shape of stylized shield are present in several positions and shapes, sometimes horizontally, sometimes diagonally. If it were true that they represent two grave markers of the Sultans, what is then the meaning of a grave marker placed horizontally or diagonally? The other interpretation differs in a remarkable way from the previous one. It dates the flag to a more recent period of between 1899 to 1919. This is based on the modernity of the flag compared to the tradition, for the arrangement of the symbols and for the structure of it, with native figures placed on a flag of American appearance. In effect the use of the blue canton with stars, one for every territory is characteristic of the American imprint and could go back exactly to 1899, the year the U.S. went to Mindanao and Sulu. In the 1800s, various countries in the world used stars in the American style on their flags with the symbolic meaning of one star for every administrative division, after they came into contact either directly or indirectly with the United States. It is beyond question that the flags exist with a dozen discovered in a Spanish museum; other flags have already been catalogued and dated. Thus, the Sulu flag with stars can be placed at about this time frame with the stars probably symbolizing the Datus of the archipelago. Anyway, with the fall of the Sultanate in 1919 and the abdication of the Sultan Jamalul Kiram II, the symbols and the flags of Sulu definitely disappeared. But even before this, the U.S. already stipulated in a treaty signed in 1899 with the Sultan that the Sultan stop flying his flag. Only recently the legitimate heir of the Sultan of Sulu, Muhammad Hadji Jamalul Kiram III ordered the realization of a new flag, coat of arms and logo. In 2001 during the ceremony of reconfirmation of the Sultan of Sulu and North Borneo, the new flag with the royal symbols were flown in the ceremonial hall. The personal standard of the Sultan similar to the Kuwait flag, is yellow and green with a white crescent and five stars of the same color, and the same size, arranged in a cross shape and a kris named "Kalis seko " with its tip that touch the fly of the flag. The colors of the flag recall those of the Sultan and the Islam (see note 1) like the crescent, the stars in the number of five recall the five historical territories of the Sultanate (or Empire) of Sulu. The kris represents the male element and it is a symbol of warrior nobleness. The coat of arms of the Sultan that seems like a decoration is similar to the symbol on the Filipino flag. It is composed of a sun with five gold rays, between one ray and the other there is a crescent overcome by a star, all in gold (yellow) color. At the center of the sun there is a green dish with the word "Allah"in white, written in Arabic. The Sultan's logo is composed of a stylized letter "K", green on a white field. K is for Kiram, the name of the royal family of the present Sultan recognized by the Ruma Bichara (Council of Datus) and by the Government of the Philippines. The letter K is charged by a gold crown who recall the royal role of the Kiram family. The same crown can be seen on some of the flags discovered recently in Spain. This element in conclusion allows the observation that although the graphical and less archaic character of the present symbols of the Sultanate of Sulu, there are some elements that send back to the symbolic- iconographic tradition of the archipelago, and as through the historical vicissitudes of their country the Sultans of Sulu have renewed own symbols without forgetting the past. Note 1 It is necessary to emphasize that it is not an accidental factor that the coat of arms of the Autonomous Region of Muslim Mindanao (ARMM) has a great resemblance with the symbols and colors of the flag, coat of arms and logo of the Sultanate. Hernandez, F., J. Hernandez Gavira, The Muslim World , 1927/199, Foundation for the advancement of Science Education, Diliman Quezon City, Philippines 1999 (edit by Lilia Hernandez Chung ). Ututalum, S.A. / A.K. Hedjazi , The Rise and Fall of the Sulu Islamic Empire (1675-1919 ) , Professional Press, Chapel Hill, 2002 U.S.A.
Sorando, L. ed., Catalogues and Notes on Flags of the "Sultania de Jol�", Museo del Ejercito, Madrid, Spain. Madaus, Michael, The Application of Inductive Research Techniques to Two Vexillological Challenges. Report of the Seventh International Congress of Vexillology, The Flag Bulletin Nos. 3 - 5 1980, Volume XIX pp.206-231. 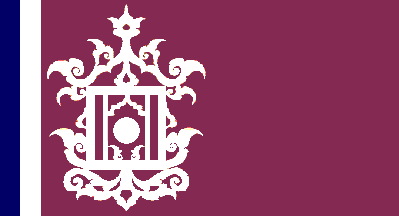 Described as Sultan Khairam III flag by Jaume Ollé, relisted as Flag of Sultan Jamalul Kiram III by Paolo Paddeu who added Jamalul Kiram III is not considered a true Sultan by most of all Suluans.